Birkeland Current Proximity Tags are active radio frequency identifiers and can be either a physical device or software application for BLE enable devices. Customized form factors, labeling, and smart phone applications are availalble. The Proximity Tag Key Fob is either carried by a person or attached to an object. It includes our 915 MHz radio which transmits an identification packet specific to its carrier. It can be carried discretely in a purse, pocket, or backpack or can be attached to a mobile object such as a pallet, medical device, or chair. The PTag is utilized best when it is always carried by its owner for Real-Time Location Services and for taking advantage of individualized preferences in the SPS and Dimmer products. The PTag can optionally come with buttons for dimming and changing LED preferences. Buttons can also be used to change the tag transmit and receive frequencies as well as to assign department numbers for roles such as human resources, security, housekeeping or maintenance. The Badge Tag functions exactly the same way as the Key Fob but can be carried on a lanyard by a user. It includes our 915 MHz radio which transmits an identification packet specific to its carrier. 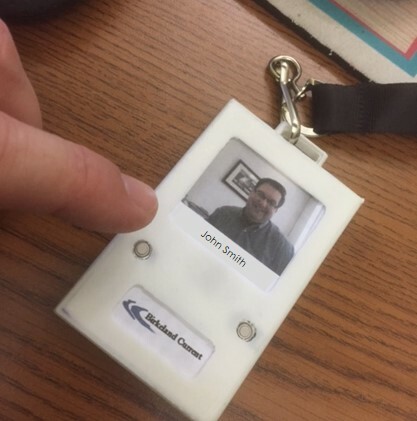 The Badge Tag is utilized best when it is always carried by its owner for Real-Time Location Services and for taking advantage of individualized preferences in the SPS and Dimmer products. The Badge Tag can optionally come with buttons for dimming and changing LED preferences. Buttons can also be used to change the tag transmit and receive frequencies as well as to assign department numbers for roles such as security or maintenance. The Phone Tag functions exactly the same way as the Key Fob but is physically part of a smart phone case (various styles and colors). It includes our 915 MHz radio which transmits an identification packet specific to its carrier. The Phone Tag is utilized best when it is always carried by its owner for Real-Time Location Services and for taking advantage of individualized preferences in the SPS and Dimmer products. The Phone Tag can optionally come with buttons for dimming and changing LED preferences. Buttons can also be used to change the tag transmit and receive frequencies as well as to assign department numbers for roles such as security or maintenance. Apple and Android phones and watches that are Bluetooth compatible can operate as proximity tags. Each device when set to Bluetooth peripheral mode transmits identification packets specific to its user. The Bluetooth compatible devices are utilized best when always carried by its owner for Real-Time Location Services and for taking advantage of individualized preferences in the SPS and Dimmer products. Software can optionally be installed which has graphic user interface buttons for dimming and changing LED preferences. The software can also be used to assign department numbers for roles such as human resources, housekeeping, security or maintenance. Direct Blue Tooth functionality is being added to all SPS and dimmer products to allow multiple tag options for different users.